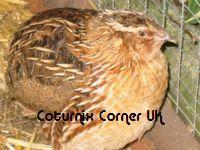 Hopefully by the time you have logged on you will have received your first ever copy of Coturnix Corner News. The Breeders Directory and Classified is very bare in this issue, but we hope it is not the case in September's issue. Please submit to us your details if you are a breeder, including breeds kept and contact details, please note that there is no charge for this service. The Classified part was empty in August's issue, this area can be used to advertise any poultry or poultry related items that you may have for sale. This service yet again is free of charge, but is exclusively for Coturnix Corner members. After several comments from various members we are looking at alternative ways in which to publicise the newsletter. Sorry for any trouble I have caused. oh i have not received any newsletter is there something wrong? Hi Kenza, newsletters were sent to all the emails that were provided during registration. I'm trying really hard to get the newsletter published on the net very soon. OK, I've taken Martin's first issue of the forum newsletter and tried to put it on the net. As I'm totally new to all this I would like the forums opinion on whether or not it would work like this before we make a start on Septembers issue. read the post above Beno, I asked the forum if it was worth continuing with a monthly newsletter and there was absolutely no response - putting together a newsletter takes a fair amount of time and work and help was needed but requests for members to supply articles were ignored. So the newsletter has been put on hold most likely indefinitely meaning there's no point updating that site. Yeah, it was appreciated, but it takes more than just 1 article I'm afraid.